A map in Appendix 2 of the report gives a sense of the many proposals, but even this map is incomplete. The proposed Park Lawn GO station (originally proposed for an extended Legion Road and a branch from the Queen 501 car) is not shown. More generally, it will be important to understand the capabilities and limitations of any new services in the rail corridors and how these will relate to the local network. A link is missing between the Waterfront West LRT and the existing system at Colborne Lodge Road rather than at Queensway & Roncesvalles (where there is no capacity for additional transit traffic). This alignment was in favour during the Miller era at City Hall, but dropped from sight along with the rest of Transit City. There is no differentiation between ordinary mixed traffic areas (Dufferin north from Exhibition Place, Bathurst Street) and locations with reserved lanes (Spadina Avenue and Cherry Street), and the “LRT” term is used for both. This is to be rectified with a consolidated plan that would be put together by a consultant plus staff from the City, TTC and Waterfront Toronto. Links to Scarborough are, needless to say, difficult given that Queen Street (the north end of the study area) ends just beyond the western Scarborough boundary. Southern Scarborough’s lakefront is very different in character with the Bluffs, and with the main street, Kingston Road, some distance north of the lake. Moreover, Scarborough’s development has focused further north (with the 401 as a magnet) while the old part of that City was left to its own devices. Two schemes for LRT on Kingston Road (either as an extension of the 502 route east into Scarborough, or in the far east as part of Transit City) are nowhere on the radar for transit investment in the medium term. GO Transit runs into Scarborough, but with a different service plan and station spacing, and with a fare structure that would penalize those attempting to make “local” trips along that corridor. Indeed, many past plans for local transit the waterfront took as a basic assumption that GO Transit simply didn’t exist as a travel option. Whether this will change substantially is hard to say, but Metrolinx is noticeably absent from the study team. We often hear about “transit first” planning, but that’s all we get – plans, but no construction. Back in 2003, Council approved the Central Waterfront Secondary Plan. That transit is especially important for commercial development because employees have to get to work, and without good transit, a site isn’t competitive with the main part of the core area let alone other parts of the GTA. This has been a major concern for developers wanting to build in the eastern waterfront. The study will include public participation and is expected to make an interim report in the second quarter of 2016 (with a final report to follow in the third quarter). At $500k, this will not be a mega-study, and that is probably just as well as much work has already been done. The question is to assemble it and make sense of the options. There are multiple types of traveller and journey along “the waterfront”, and in the desire to be “regional” (and possibly attract subsidy dollars) we must not lose sight of the substantial local demands. Moreover, some parts of the study area, notably King and Queen Streets, are only tangential to the waterfront, not an integral part of its transit service. They deserve attention and improvement independently of any “regional” or “waterfront” role they might play. What is badly needed here is a study that looks first at actual needs, and the diversity of locations to be served, before trying to nickel and dime the exercise by combining or foregoing routes. SmartTrack advocates are particularly bad on this account as they claim that their project solves every problem when in fact it only touches on part of the regional needs, some of which are not even in Toronto. What service level will SmartTrack actually be able to offer, and how much of the study area can it realistically serve given its location? Is an “LRT” line to Long Branch actually necessary (effectively an upgraded version of the Queen car) as opposed to simply improving service on Lake Shore and providing streetcars with a faster route to the core? How does this relate to the proposed Park Lawn GO station? What route will a Waterfront West line take to reach The Queensway, and what areas will it serve? What are future plans for the Exhibition Place lands, and can these be served only by a line running along its northern edge under the Gardiner? Is an LRT line actually feasible on Bremner Boulevard given competing uses of land and traffic patterns? How will the line on Queens Quay West deal with increased traffic to the Island Airport? What can be done to improve transit capacity through Parkdale, Liberty Village and points further east along King Street? Is diversion of any of this demand a reasonable goal? What is the practical capacity of Union Station Loop as redesigned to accommodate more services, including the link to Union Station? What is the likely buildout timetable for the eastern waterfront including its transit components? When will new demands arise for which capacity must be in place in advance? 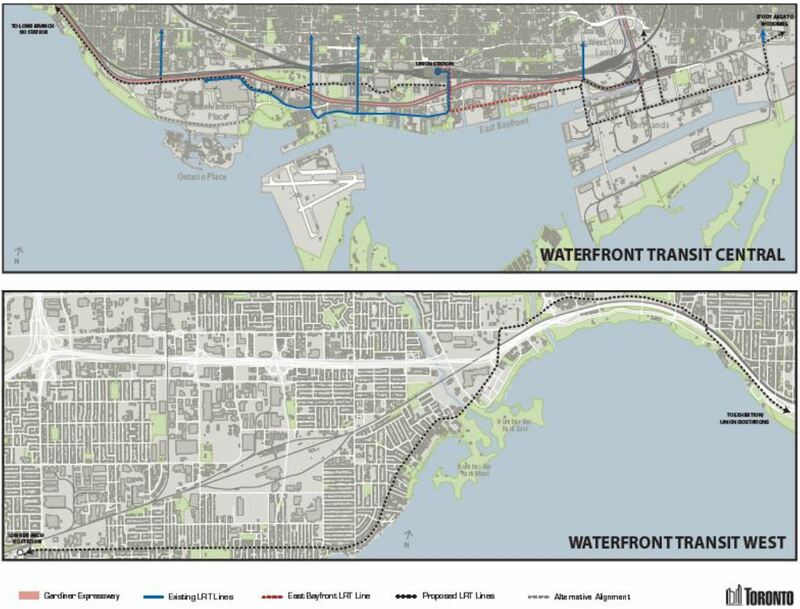 Will eastern waterfront transit’s priority be hijacked by other “regional” plans that look good on a map, but do not provide the fine-grained access these lands will require? The City and Province have ignored transit for the waterfront, the core area and “downtown” for years because it suits many politicians to champion transit in the suburbs where, to be fair, there is an even greater need for improvements. The problem, of course, is that development downtown has not stopped, while “transit first” threatens to be “transit last, if ever”. This must change, and soon. The Waterfront West Environmental Assessment included various options for this line which are mentioned in the Executive Summary, but not illustrated. Here are the detailed drawings [large pdfs]. The alignments using Colborne Lodge Road are Route 3A(ii) and Route 4B. This entry was posted in A Grand Plan, King Car, Kingston Road, Queen Car, Transit, Union Station, Waterfront. Bookmark the permalink. Clearly there needs to be a funding component to this … some sort of directive that TTC or Waterfront Toronto must spend X$ or X% of their funds on transit. Without this the money will always go to something else more pressing. Steve: Neither agency has money without funding from other governments. It’s not a case of telling the TTC or Waterfront Toronto “go build this”, but of convincing politicians that they should take transit in this area seriously. Moaz: the city is looking at a Transport Master plan for the Humber Bay Shores area which is a necessary part of answering this question, as well as determining the relationship between streetcars, GO transit and express buses (once the double fare for the Downtown Express buses are removed usage patterns may change). The budget is (last I heard) being sought. Meanwhile residents in the area want to see transport improvements first, then a GO train station at Park Lawn (but not at the expense of the existing Mimico station … which is also used by employees going to/from Willowbrook yard). Mark Grimes brought motion 11 through council asking for “building a connection between Exhibition loop and St. Joseph’s” to be studied. As you said in your post, the intersection itself no longer has capacity to absorb more streetcars. One wonders if it may simply make more sense to realign Lake Shore through the Sunnyside area, replacing the wide wide medians with extra park space to the south and making room for the LRT. Steve: That, roughly speaking, was the plan on the table when David Miller was mayor. Let’s solve the Island airport traffic congestion problem and the Ontario Place and Island access problem in one go … extend the 511 to the island then go west to Ontario Place. Steve: I hope that this is a joke. I’d think that a Bremner streetcar is more likely than an LRT. But … I think there is room along the rail corridor and under the Gardiner and along Bremner for 1 track. Would a 1way loop east of Strachan be too much of a problem provided that the other direction was about 100 m away? Steve: There would be big problems sharing the rail corridor completely separate from issues of access by riders. This is a similar situation to crash strength issues for LRT and railways in the same corridor without temporal separation. Also, if anything is going to pry space loose in this general area, it will be the DRL, not one leg of the Bremner line. Moaz: I seriously think that we won’t be seeing increased traffic to the Island airport for some time. But as I said above, why don’t we get serious and build the 511 connection to the Island and airport? It will also prepare us for a future when the island airport may no longer be needed and the lands are redeveloped like Edmonton did for their city airport. Plus as Ed Levy pointed out, this was the old plan. Steve: We have just at great expense built a pedestrian tunnel to the airport with no provision for transit. There is a point at which we have to tell the airport and related interested parties that continuing to screw up the city with demand we cannot handle simply isn’t an option. Moaz: I often wonder if a painted right of way on King between Roncessvales and Dufferin would help improve reliability on the King car. Steve: No. First off it would be ignored. Second, there are issues with intersection operations in some locations. Third, taking away parking will not be popular in a residential area (this is not just a peak period, peak direction issue). We know from experience on St. Clair years ago that white paint does absolutely nothing to deter motorists, and nobody enforces the lanes anyhow. This is a core issue, and needs to be at the center of the debate surrounding transit. Somewhere, the development and livability of the city itself has been lost in the transit for politics arguments. It would make a great deal of sense if we started to look at transit in terms of the network and what else is required to support any given change. SSE, and Yonge extension to Richmond Hill – both require a DRL to make them function network wise, even the Crosstown will add to the pain on Yonge, the waterfront east or west do not require the same sort of changes to the network in order to allow development, and have a real impact on the development of the city. As such they really should be near or at the top of the heap (at least until we get core bound capacity sorted out), substantial improvement for a large number of people, at a relatively modest cost – and the possibility to deliver transit oriented development and notable growth to the tax base. So is it worth doing if the corridor has to be expanded to allow the tracks to be moved to insert a centre platform? Steve: Possibly not, but until now we have not even seen an engineering response to the idea from Metrolinx. Too many plans sit as “proposals” for want of a “this could work” or “this will cost a fortune” or “this is totally impractical” evaluation. Politically, nobody wants to say “no”, only that “well, that merits further study”. East Bayfront LRT was proposed before the brilliant idea of SmartTrack was conceived and East Bayfront LRT will be obsolete once SmartTrack is up and running. Steve: SmartTrack (brilliant or otherwise) serves a completely different demand. It will only have a station at the Don River to serve the Great Gulf development, and nothing from there to Union (don’t believe the maps that show intermediate stations because they are impratical from both operational and physical points of view. Queens Quay is well south of the rail corridor, and the Port Lands even further away. SmartTrack won’t serve their demand. I have the same concern, Steve. As a user of the streetcar on the Lake Shore, this service sounds great, but my one concern is how will this new service actually improve service along the Lake Shore, especially as I’ll continue to use my 20 minute ride to Union on the GO train. It’s the local service on the Lake shore that is in desperate need of improved service. Steve: The TTC plans to implement new schedules on the 501 in either November or January (not sure yet which it will be) that should include better scheduled service west of Humber Loop. This should improve wait times, if not travel times, for trips to the core. Sort of restoring the 507 – and I don’t care if it goes to Church or (preferably) Dundas West – nothing the TTC will do is likely to succeed unless the TTC seriously puts the time and effort into the system. The TTC has had 20 years to fix the 501 (since it absorbed the 507) and as a user of the 507 portion of the route, I will not believe anything the TTC does for the route unless the TTC actually takes the issue seriously. They divided the service on a trial test a few years ago and then abandoned it. Steve: That “trial” was designed in a way guaranteed to fail, and staff regularly sabotaged it. “Let’s solve the Island airport traffic congestion problem and the Ontario Place and Island access problem in one go … extend the 511 to the island then go west to Ontario Place. Moaz, I have two problems with this: 1) As you stated, there may not be increased traffic for some time, and 2) the current route of the 511 provides a direct link to the Exhibition grounds from Bathurst Station. This is beneficial, not only during the Ex, but also for the other events such as the Molson Indy, Marlies games, and the Royal Fair. So all those passengers should have to change at Bathurst and Fleet just so the Island Airport gets a streetcar? Better to put another route on to the airport if that’s what you want. I’m guessing that the 2009 Western Waterfront Master Plan approved by city council on August 5-6, 2009, is also on reset? That plan would have shifted Lake Shore Blvd. W. northward to create more parkland to the south, and other “adjustments”. Steve: See the plan options described on page 69 of this report. This includes the Colborne Lodge alignment to which I refer in the article. There is a detailed map of it somewhere as part of this study, but I would have to dig around to find it. This plan was one of many initiatives that turned into a puff of smoke when Rob Ford became mayor. Steve, I’d like to hear your recommendations. First off I agree the Western Waterfront has grown and requires more public transit due to recent growth. But a BIG part of the reason they’ve grown is??? Well … because they’ve had attractive public transit to begin with. How in the hell can we re-vitalize Scarborough without a “future” plan to begin with? I get it Humber bay is full of high-rises allowed to be built around the STREET CAR. Now they want an upgrade while Scarborough has nothing & hardly gets a mention? Well there was that BS Transit City line the was never ever getting funded. Kingston Rd may not be direct “waterfront”. But it leads to the Waterfront in Scarborough and would be key City attraction areas like Bluffers Park, the Guild, and Port Union/Rouge at the far end of Lawrence. Kingston Rd passes through built up Priority neighborhoods in the Scarborough Village, Kingston-Galloway neighborhoods. I know I’m a rare breed as most of you on the forum live close to Central or West of the City and could give a crap about the Eastern citizens. If anywhere screams re-development & requires immediate attention it’s the Eastern corridor & it seems this City is too big to even talk about it with any seriousness. And then there the funding topic. Maybe we can stop the SSE and give the saving to the re-up the West. Wouldn’t that make the Metroland & the Star randy. Also please don’t rebut with the Old Scarborough chose the car in previous generation debate. Things have changed as well & this is about the FUTURE & the future should be reviewed for all lengths of the CITY to grow together. Thanks again for allowing a concerned Scarborough resident post here. Steve: I think you need to split apart comments about growth in areas like Liberty Village which does have transit (although not enough of it) and the Humber Bay where the number of residents vastly outnumbers the capacity of the available transit, and demand in much more auto-related. Liberty Village and surrounding neighbourhoods has one feature that neither southern Etobicoke nor Scarborough have — it is close to downtown — and this has a strong effect on demand for housing there. Humber Bay, by contrast, was developed much more as an upscale part of the city oriented to the Gardiner and with the lake as a primary selling feature. I agree that Kingston Road and southern Scarborough have been overlooked for decades, but the SSE won’t solve problems of that area. The closest any new station will come is Brimley/Danforth and that presumes this station is added to the plan. It does not matter what technology replaces the existing RT, Kingston Road will still be relatively isolated from a transit point of view. As for “Scarborough chose the car”, this is a matter of history and it has shaped how the city grew, notably a shift in focus north from Kingston Road to the 401. Also Kingston Road, unlike Lake Shore around Humber Bay, is not right on the water, but separated from it by a residential area (not to mention the Bluffs) more like southwestern Etobicoke where Lake Shore Boulevard is roughly half a kilometre north of the lake. That’s not to say that Kingston Road should be ignored, but southern Scarborough must be viewed in historical and geographic context. One suggestion, instead of tunneling, couldn’t they just build elevated parts of the line. They could use an elevated structure to cross from Queensway to the south side of Gardiner eliminating the LRT from crossing through the busy Roncy intersection. This could get pricey like the Calgary West line did. Although an elevated line on Bremner beside the Skydome will resemble the El subway next to the Yankees Stadium. Probably a bad idea. Steve: The problem with an elevated link is that it must be somewhere west of Roncesvalles, and that involves flying over the Gardiner and rail corridors. It is much simpler to reconfigure Lake Shore so that the line would connect in at Colborne Lodge Road. The only place where there will be a new tunnel for the waterfront line is the short segment on Queens Quay East from Bay to Freeland (east of Yonge). As for double-ended cars, you have to remember that when the Spadina/Harbourfront infrastructure was built, Toronto was still well over a decade from getting a new fleet, and any design was rooted in single-ended equipment. Was it a good design, especially at Union, not really. If we were actively in the process of updating our fleet at the time, consideration for DE operation might have influenced the design. What is the appeal of a GO station at Park Lawn Road? Steve: It is perceived, wrongly I think, as a “solution” to transit problems in the Humber Bay area. The thing is – this is one of the reasons that I think the SSE money is about right, but the wrong plan. There are a bunch of areas within Scarborough that require huge improvements in service, but do not see how they reasonably align with a single line, and supporting real improvements in many areas means getting out of general traffic. The other problem now is – to what degree would improving Scarborough service drive increased ridership to the southern portion of the Yonge line. A broad approach should permit connecting to GO as well, but that service needs to be much more attractive, even if we radically improve the connection to it. In reference to your comments about the options of where to connect the Waterfront West line to the existing Queen/Queensway line you might find this useful. P.69 of the Executive Summary lays out the options. To be blunt, the community and I felt strongly that a new TTC bridge up from the Lakeshore to Queensway and Roncy was …umm… insane. The TTC felt differently. Much better was a connection at Colborne Lodge. The question was never settled. Steve: I have updated the article to include the drawings of various proposed alignments. The detailed EA does not appear to be online, and I have only excerpts. I am familiar with the neglected Scarborough-Malvern LRT plan, but not a Kingston Rd LRT extending into Scarborough from Queen. From when does this date? And has anyone studied the likely demand for through-riding on Kingston? The current network is skewed towards the subway forcing a rider making a straight trip along Kingston (if anyone would do that) to ride 4 routes. What would be the implications of either re-jigging the network to provide a straight trip, or simply adding a through-route? Steve: This was a scheme pushed by former Councillor Brian Ashton about a decade ago. It was incorporated into a design plan for revitalization of the western part of Kingston Road that raised a lot of hopes, but never got off of the ground. None of these plans seems to take into account the idea of moving the eastbound Lake Shore traffic lanes north to sit alongside the westbound lanes. In fact, the westbound lanes are moved south of the Gardiner. I was under the impression the long-term plan for the area was to move Lake Shore as far north as possible to free up more parkland. Did that idea come after these plans were developed, or does the TTC simply not care? Steve: The plans are at the scale they were available when the documents were published, sorry. As for the Lake Shore alignment, I am not sure whether additional work was done after these plans, but by then it was 2009 and David Miller’s term was nearing an end. A lot of things, including the Western Waterfront plan, just stopped dead. I can’t see what the point of the Waterfront West LRT is. If Lakeshore West gets electrified and the Park Lawn station is built this is pretty much useless because it is a lot slower than GO. The Queen’s Quay East LRT could easily be replaced by less expensive buses. There are likely to be other transit options like the downtown relief line in this area. Steve: I might agree to a point on service from the Lake Shore, but there is also the question of what is happening in Parkdale and the CNE lands. Park Lawn Station is tricky because it would be a GO fare, not a TTC fare, and unless there is good connecting TTC service to it, its ability to attract riders will be limited. Back in the days this was first proposed, the idea was to put the station at Legion Road and run a streetcar spur up to it. This would replace the Humber Loop. As for Queens Quay East, that’s quite another matter. The proposed developments along the waterfront and south into the port lands would strain any bus service with the additional problem of getting all those buses north to connect with the subway. The area is highly logical for redevelopment – as long as you can reasonably move in and out using reasonably direct transit. This should really be prime ground for redevelopment, as long a solid plan can be executed. However really substantial redevelopment here requires capacity downstream. I was under the impression that the DRL was going to try and find a corridor a little to the north of this. Have they at least started to secure an actual corridor into and through the core for this subway line (or stopped giving permits within their possible choices). Have they ensured that they can enter the core from the east, and link through to actually support a new train station to increase capacity to the west? Would it not make sense to design the DRL to be able to extend a little further west, and so it could meet an LRT someplace that the LRT could actually get to? Say the end of Queensway (my favorite) or even the CNE grounds? Should this not be a route being preserved now? Even if the LRT were to be a decade or more away from being funded?. Would this not provide some the needed capacity to continue to improve streetcar service Roncesvalles and east, while still permitting development to move north? I would have thought areas to the south of the rail line would be hard to run a DRL through (although hard to run a LRT underground as well). Steve: Because the DRL has been on the back burner (hell, not even on the stove) for so long, there has been no thought about corridor protection. A big challenge for the downtown leg is just that — even as recently as the West Don Lands planning (the Canary District, Pan Am Village, etc), nobody made any provision for transit that might come through that district. A Park Lawn GO station and electrification might help with all the new residents of condos along the lake, but it does not in any way solve transit issues along the western lakeshore. GO is not a network, and unless you want to go to Union station or somewhere else on the Lakeshore line, you are out of luck as you wait for some kind of connecting local transit route (assuming fare integration in the first place). As for local transit, a GO rail line is not that. Even if more stations were built, such as one at Kipling, the railway tracks are in industrial zones and are awkward to access if you live in most of the area. Humber College is building a big campus at Lake Shore and Kipling, and that location alone is good for many transit-dependent riders. In fact Humber College is a regular participant in meetings about transit issues, because the college and the students feel them first-hand. Makes one wonder if there is a basic understanding of compounding? 2-3% growth may not sound like much – but even this has notable impacts on portfolios, 2.5% for 15 years is basically 45%, 25 to 33 (33 trains per hour is 110 seconds) is only 31% growth and even 36 trains per hour (hard to see 100 seconds or less) is only 44%. So basically if we achieve 33 trains per hour, well we are screwed, if we get to 36 things only remain as bad as they are … if we get to 33 and 7 car trains, we are still out of room in 15 years, assuming 2.5% growth. I am vaguely under the impression that even if Yonge were to be able to support the wildest engineers’ fantasy numbers – it would be out of capacity – with all possible changes in 15 years (short of twinning the tunnels). It sounds as though the city would be well served by meeting with a financial planner or debt councilor, and just review these numbers like household financial flows, it is obvious that there is a huge issue, and ridership growth is like compound interest, and roads with autos are like credit cards – the most expensive thing to use. I have the sense that it would be a miracle – assuming that there is still a reasonable and viable route, and real political will – that a DRL could be completed within the next 15 years. I am also under the impression that if Toronto is not careful, it will not only become a miserable place to live, but suffer a very painful loss of relevance when it can no longer absorb growth effectively. The subway is only one step into moving Scarborough onto a bright future. The LRT vs subway debate is nonsense. The subway will do a ton to integrate the greater part of Scarborough into the City of Toronto in terms of attractiveness, commuter effectiveness to our main job center, City equality etc…. But it should not be confused with an effective rapid transit network around other important/neglected areas of the large mass of Toronto we simplify as Scarborough. Even if it takes 100 years for other areas to receive a properly funded transit plant the main backbone will be in place & that’s of the upmost importance for the FUTURE. By your logic downtown Toronto should still be riding horses and attractive local transit is only required within a certain distance to the Waterfront. History is just that but don’t get stuck in it. Time to move forward and not keep picking winners and losers for the ridiculous reason you mention. Steve: You completely misrepresent my argument, but I’m not going to waste time debating the point. Downtown Toronto had a substantial concentration of jobs and housing while most of Scarborough was farmland. You’re the one who brought up the condos at Humber Bay and their proximity to the water, and I was only pointing out that Kingston Road on Scarborough is not at all comparable. But you’re welcome to your distorted view. I’m asking we plan for the future of the City as a whole. Yes each area has different needs but to leave out an already neglect chunk of Toronto because they never had a previous streetcar line & the main road is further back from the lake is sickening and not healthy for the City’s future. Steve: My argument had nothing to do with an old streetcar line, but with the fact that the major transportation link in Scarborough is the 401, and it is a long way from Kingston Road. Along with any reset, we should likely have a development freeze. Radical, but things are sooo messed up/neglected largely from the City’s doings and undoings (with at times an ‘assist’ from the province with the OMB that keeps OK’ing larger developments sans context), we not only need to have a plan developed but in place ahead of more buildings up. Of course we could try changing things close to overnight with political will, like a King St. RoW to make up for the Queen st. subway not being built in 1946 or whenever, despite approval by voters, but political will is pretty absent as shown with the simple line of paint on Bloor St. E. between Church and Sherbourne for a bike lane as per 2001 Bike Plan, and yes, I see bikeways as a transit relief for some of us, to some degree. When struggling agin the Front St. Extension and advocating for transit options instead, and a transit project, there were a range of transit options, including what I thought was an obvious one of using Front St. for transit. With options for going to the NW and out to Etobicoke once past Bathurst. Nobody elected stuck up for transit-first with that quarter-billion, tho at least the road folly was killed. Towards the latter stage of the FSE fuss, I went and explored the WWLRT EA from 1993, and it’s salient in saying that the WWLRT will NOT do a good job in the east-west out to Etobicoke, that’s a separate project, and they’d actually modelled out the time of a commute using a Front St. transit connected to the Queensway. There may be still some possibility of transit improving on Front St., as it has many real destinations and potential for connections direct at Union, but with all the lack of planning, not only are things obscured, but hey, fresh projects just finished thereby keeping the concrete and construction industries happy with lots of work forever. Because of the failures of most all of the pols in addressing the trans*it issues, we may not even get a chance to have a weak option of improvement occur by the usage of the lands north of the Weston corridor from Queen/Dufferin over to Bathurst/Front thereby having a small bypass of the congested core into Front St. Some of us are only seeing transit as heavy rail vs. possibly busways, and even a one-way inbound busway in mornings and reversal at night, might be better than nada. Another improvement for the east-west would also be a busway on either the Gardiner or the Lakeshore, but the contempt for transit is very entrenched, and obvious in the ignoring of the Places to Grow Act in the Gardiner repairs, and no, we couldn’t think of doing any special boost to transit on either Gardiner or Lakeshore prior to construction and the how many hundreds of millions. I also found it curious that we needed an EA for a Bloor St. bike lane for the 8kms using cheap paint (8kms of subway relief for $200,000), but the huge sums and great disruption of the Gardiner repairs and subsequent boosts in air pollution merited nada. Lots more atmospheres down at the mall…. Joe should spend more time learning Scarborough transit history, since there was a radial line along Kingston Road to West Hill until 1930, and regular TTC service ran to Birchmount loop until 1954 (when the newly-created Metropolitan Toronto, rather than those pesky downtown elitists, instituted fare zones and cut back service). Transit Toronto is a good place to start to learn about streetcars on Kingston Road and Birchmount loop. Joe – the fact is that history leaves certain facts on the ground. There almost no roads downtown that enjoy a wide ROW, but there is lots of density. So what can do with a 20 meter or less row? What can you do with a 36 meter++ row? Are they different? Do cross streets every 70-100 meters or so , make running surface transit harder, than cross streets every 200 meters or more? Does trying to support an suburban density of below 50 or even 25 people per hectare, change your level of close to stop ridership, from one where you might have north of 100+ or even 250 or close to 500 people per hectare. Should this affect what you run, and how you approach building transit? All these are artifacts of history – that determine what would be best plan in the current world! PS – The other question that needs to be dealt with looking at transit – how much has to be built to serve how many – is also a question of history. Business locate to be close to other businesses, people move based at least in part on the ease of their trip to work, and the services that are readily available to them. So that also means, in a city that appears to be very thin on dollars, we need to ask ourselves – where can we spend a little and have a large impact. So we are looking for a handful of miles of transit that will unlock the maximum potential, and have the minimum negative effect on the operations of the rest of the road and transit systems. If you can serve an area that will have people either counter commuting, and using open capacity, or only riding the link you built to serve them, does that mean minimal negative impact. East Bayfront appears to allow new development for 30k jobs and 50-90k residential increase, while requiring only say a $500 million dollar investment, are there comparable projects? Does not most of the other projects require downstream capacity to work, and more capital dollars even for the direct project? We need to start looking at these projects in terms of bang for the buck – and how they will affect the cities ability to operate and pay for more transit. Steve: There is an interesting comparison in Scarborough and Etobicoke where grade separations of major roads created a big gap in the local street system. In Etobicoke, the Six Points interchange destroyed a collection of local roads that are only now being stitched back together with some semblance of an “Etobicoke Centre” so long missing from that “City”. In Scarborough, the Danforth/Kingston Road split creates a gap where roads used to meet. Both of these show the effect of imposing a car-oriented transportation design, and it’s no surprise that newer areas close to the 401 exhibit similar problems. That is an extremely good point – and speaks to a need to correct this. However, I do not believe that there is a situation where the business case is quite as stark as it is here. However, it does scream to the import of ensuring that whatever is built in Scarborough support a 401 crossing. I think extending the Scarborough RT replacement north of the 401, would improve service both for those residents, and for the businesses focused around the STC. I cannot help but thinking, that even now, for the STC to have real prospects, it needs a wide set of bedroom communities – well served by transit.